Fluorinated greenhouse gases (GHG) are also known as F-gases and include hydrofluorocarbons (HFCs), perfluorocarbons (PFCs) and sulphur hexafluoride (SF6). While the dominant GHG, carbon dioxide (CO2), remains in the atmosphere for 100 to 500 years, or longer, and methane stays for only a few decades, F-gases remain in the atmosphere for thousands of years. At least in this aspect, they are like some radioactive compounds that have half-lives of tens of thousands of years. 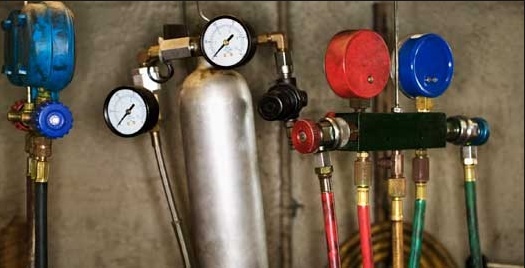 HFC gases are used in various industrial applications, especially for refrigeration, air conditioning, heat pump equipment, and fire extinguishers, where they have replaced ozone-depleting substances that are being phased out under the Montreal Protocol; PFC gases are used in the electronic sector; and SF6 gases are used in high voltage switchgear and other production processes. Most GHGs have been reduced since 1990, but F-gases have continued to increase, by as much as 60% since 1990, in large part from the use of HFCs for refrigeration in place of ozone-depleting chemicals. As a result the European Union (EU) took legislative action in 2006 to reduce F-gases and is currently attempting to devise further actions since the F-gases continue to rise. And just recently the United States and China have agreed to take action to reduce use of HFCs. Compare the mitigation efforts necessary to reduce methane and CO2 emissions with the efforts to reduce F-gases. Do the mitigation efforts for each overlap, i.e., can mitigation efforts to reduce methane or CO2 also have the effect of reducing F-gas emissions. Which of the GHGs present the greatest challenge for people and governments on the island of Ireland. Susanna (Ala-Kurikka) Williams, “The Battle Over Fluorinated Greenhouse Gases Begins,” European Environmental Bureau (EEB) newsletter, Metamorphosis (#68, March 2013). See the “Commentary” section of current issue of irish environment (July 2013).